The parties involved in completing Jimmy Garoppolo‘s record five-year, $ 137.5 million contract with the San Francisco 49ers stressed that it was mutual interest that enabled them to get the deal done so quickly. Garoppolo, who was 5-0 in the games he started for the 49ers this past season, said he knew he wanted to remain with the 49ers and wanted to get things settled. “I wanted to get the deal done as quickly as possible,” he said. “Having the same common goal really helped, and knowing I really wanted to be here. The magnitude of getting a contract that sets an NFL record for the highest average annual salary in a multiyear deal despite starting only seven NFL games is only starting to sink in. The deal indicates the 49ers believe Garoppolo is a key to their long-term success. “We got a piece to the puzzle today, and it’s definitely a big one,” head coach Kyle Shanahan. The Super Bowl is the goal. Garoppolo’s former team, the New England Patriots, lost the Super Bowl to the Eagles, but Garoppolo said he learned from Tom Brady. Garoppolo has months to prepare for the 2018 season, and he and Shanahan noted this will give the quarterback time to fully immerse himself in the team’s offensive philosophies. Shanahan and Lynch both said the three months of getting to know Garoppolo as a person solidified their notion that he was their long-term answer at quarterback. Lynch gave a special thanks to the York Family, owners of the 49ers including CEO Jed York, for providing the financial wherewithal to get the deal done quickly. “It’s easy spending other people’s money,” Lynch said. And they spent a lot. The details of Garoppolo’s contract were ascertained by ESPN’s Adam Schefter. Garoppolo receives a $ 7-million signing bonus and a guaranteed $ 28- million roster bonus. His $ 6.2 million salary for 2018 is guaranteed, and he will receive a $ 600,000 workout bonus as well as a $ 800,000 per-game roster bonus. That gives him a year-one total of $ 42.6 million. He will have the same workout and per-game roster bonuses as well as a $ 17.2 million salary in 2019, with $ 7.5 million of that salary guaranteed. Garoppolo’s base salary for 2020 will be $ 23.8 million, with $ 15.7 million of that guaranteed for injury. The same workout and game roster bonuses apply. The base salary is $ 24.1 million in 2021 and $ 24.2 million in 2022. These are not guaranteed, which gives the 49ers that amount to club options for the final two years. A $ 7.5 million injury guarantee would go into effect if Garoppolo makes it to NFC Championship game or is named to the All-Pro first or second team. 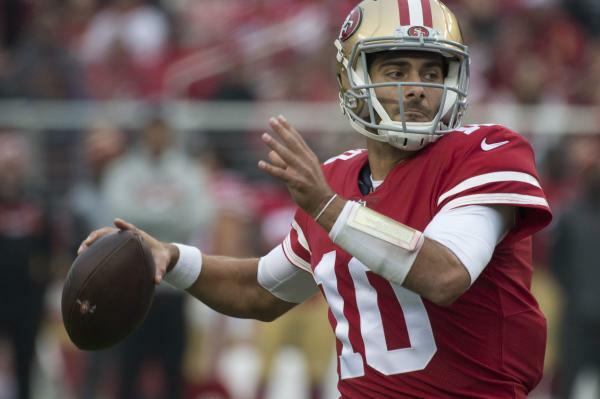 The 49ers could have used the franchise tag to ensure they kept Garoppolo for a year, but they wanted to get a long-term deal completed to indicate he is their quarterback for the foreseeable future. Although he has started only seven NFL games — two with the Patriots in 2016 and five with the 49ers in 2017 — he has a perfect record in those starts. Acquired this past season in a midseason trade with the Patriots in exchange for a 2018 second-round draft pick, Garoppolo made his first start for the 49ers in a Dec. 3 game against the Chicago Bears. The 49ers had a 1-10 record at the time, but they won their final five games with Garoppolo at the helm to finish 6-10. Garoppolo got a strong endorsement from offensive tackle Joe Staley, an 11-year veteran and six-time Pro Bowl selection. ” … He came into the huddle and practice when he was there for two days and really just kind of took over,” Staley told SiriusXM NFL Radio on Thursday. “He was kind of snapping at guys, ‘Hey, pay attention. This is what we’re doing right here.’ There was no kind of feeling-out period with him. In his six games for San Francisco, including one in which he did not start, Garoppolo completed 67.4 percent of his passes for 1,560 yards, seven touchdowns and five interceptions. Garoppolo won his two games he started for the Patriots in 2016 when Brady was serving a four-game suspension for his part in Deflategate. Garoppolo injured his right shoulder in the second game that season, and was replaced by Jacoby Brissett for the final two games before Brady’s return.